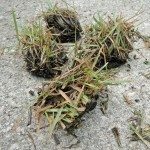 Could you please tell me whether Zoysia grass is safe for horses to eat? A friend of mine has two horses and is considering purchasing a 3 acre parcel of property. One half of the pasture is planted in Zoysia grass. We would like to know whether it is safe for the horses. Thank you. Zoysia has quite a few weaknesses as a pasture plant. While, it may be tough enough to tolerate harsh conditions and heavy traffic, making it good for lawns, it isn't very tasty or good for horses. The grass produces mildly toxic substances, which are meant to repel pests, but can irritate horses. Therefore, it may be best to steer clear of zoysia grass for use in a pasture.